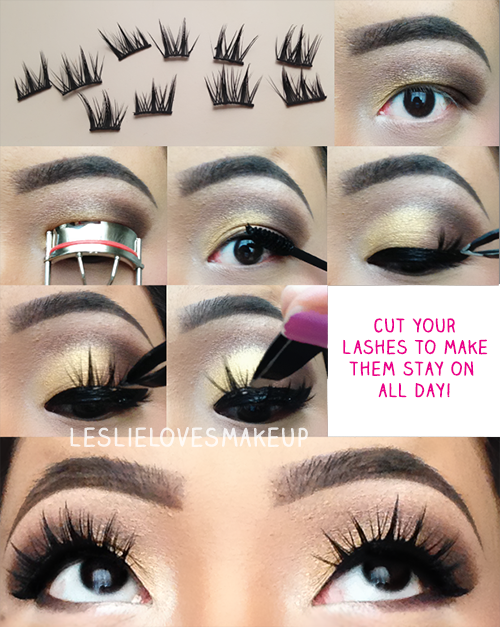 I use Modlash's clear eyelash glue to apply my lashes. It dries fast and does leave a shine but I usually go over it with my NYX black liquid liner again. When I apply my lashes like this, it stays on all day because it's able to bend and flex when I blink. Usually when I put the whole strip on, the front or end starts to "lift" off my eyes which looks ridiculously weird and unflattering. With the cut up pieces of lashes, I rarely find lifting, and i'm able to to get them closer to my lashes, making it look more natural. I've been getting compliments on my lashes lately and the best part about doing it this way is, you can double stack where you want it to without having it feel super heavy. I hope this helps and I hope you all enjoy! Stay warm!